CEO Mr. Lokesh Makam gets covered in April 2016 edition of Business of Agriculture magazine!! Indian farmers struggle to make ends meet – one of their major worries is the pests that damage their crops and put all their hard work to waste. According to government data,crop losses due to pests in India almost touch Rs 120,000 crore annually. For decades, the only solution to this problem presented to the farmer has been chemical pesticides.The pests are controlled by spraying chemical pesticides worth Rs. 35,000crores annually. The chemical pesticides are expensive and not always effective in addressing this concern. The white fly menace in Punjab and the huge loss to the cotton farmers made headlines a few months ago. As most of us know, pesticides often cause more damage than good –they harm the environment, farmer health and even get into the food we consume and spoil our health. The high MRLs in crops have closed many doors to export opportunities. For instance, Rs.1800 crores loss due to mango export rejection recently. Add to that crops like tea, grapes, guava and the numbers just keep growing worryingly larger. Barrix offers the farmer safe, easy-to-use, effective and cost-efficient alternative to deal with fruit flies and fly pests which could cause crop loss of up to 70%! Barrix develops, manufactures, distributes and markets IPM (Integrated Pest Management) products - an effective alternative to chemical pesticides and seek to bring about a revolutionary change in the area of pest control. "Instead of treating the symptoms, we eradicate the root cause," says Lokesh Makam, who founded Barrix in 2011 with the aim of protecting farmers from the harmful impact of using chemical pesticides and the financial strain of purchasing them. In a span of 5 years, we have seen multiple-fold growth and various recognitions. With presence in 12 Indian states, we have a supply chain base exceeding 2700, workforce over 300 touching lives of over 2 lakh farmers and clocking revenues over INR 7 crore from Apr 2015-Jan 2016. 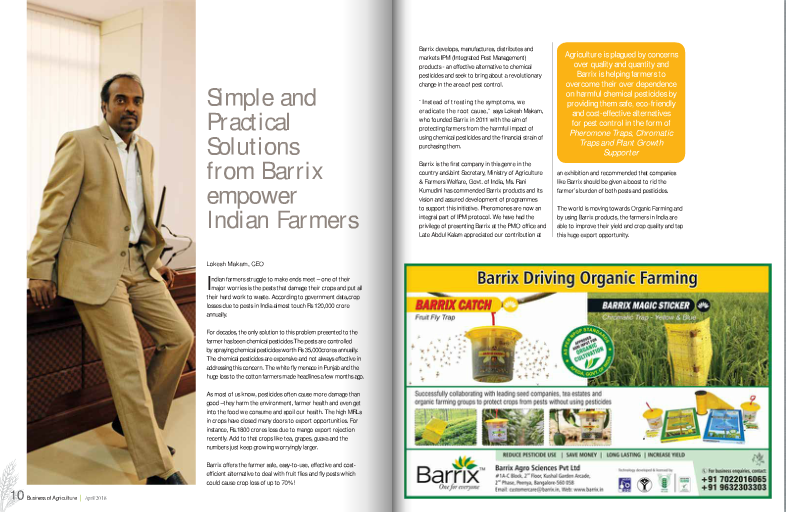 Barrix is the first company in this genre in the country andJoint Secretary, Ministry of Agriculture & Farmers Welfare, Govt. of India, Ms. Rani Kumudini has commended Barrix products and its vision and assured development of programmes to support this initiative. Pheromones are now an integral part of IPM protocol. We have had the privilege of presenting Barrix at the PMO office and Late Abdul Kalam appreciated our contribution at an exhibition and recommended that companies like Barrix should be given a boost to rid the farmer’s burden of both pests and pesticides. The world is moving towards Organic Farming and by using Barrix products, the farmers in India are able to improve their yield and crop quality and tap this huge export opportunity.